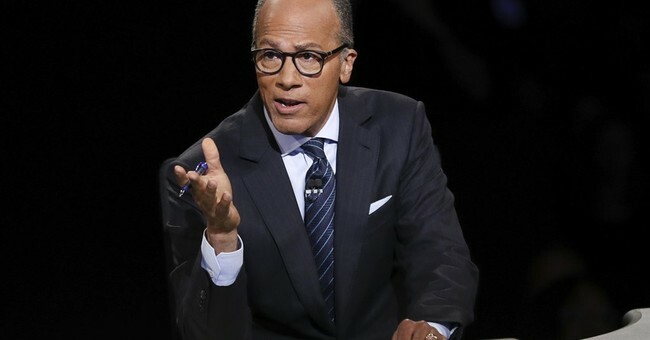 In Townhall's initial assessment, some of us concluded Lester Holt was a fair and neutral presence in Monday night's showdown between Donald Trump and Hillary Clinton. Other viewers, however, did not see it that way and make some good points. Trump-friendly audiences were not happy that Holt spent countless minutes asking the GOP nominee about the birther controversy, his tax returns, and his past comments about women. The moderator also interrupted Trump more often (although that may be because Trump exceeded his time more often) and saved his only fact checks for Trump's answers on the Iraq War. This explains why Heat Street dubbed Holt the "Third Debater." This is exactly how I saw the debate go last night. Hopefully, many people saw how one sided the debate was. It's also worth noting what Holt did not ask. The GOP found an important list of topics Holt managed to avoid at the debate that would have put Clinton on her toes. They provided the list in a press release on Tuesday. Will Clinton be forced to answer these questions in the following debates? Or will it be up to Trump to bring them up?